During your orthodontic treatment process, the inside of your mouth will feel sore from now and then. A saline rinse is a quick and easy way to manage your discomfort and promote healing. Most orthodontics patients experience irritation and soreness at the beginning of treatment, and also after their adjustment appointments. Why? Because the teeth, gums, and the inside of the cheeks and lips need time to adjust to the new shape and position of your braces. The braces will rub against different spots inside the mouth, causing irritation and sores. 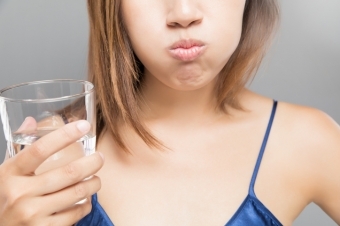 Saline solution is a mixture of salt and water that you swish around in your mouth to sooth oral irritation. How does saline solution work? Saline solutions do two things; they provide mild pain relief and promote healing. The saltwater works as something of an antiseptic, gently washing away bacteria from the affected area, and reducing the alkalinity of the mouth. Saline solution also helps bring down swelling. A salt water rinse is a relatively mild, short-term solution to your oral discomfort; if you find it’s not effective, an over-the-counter anti-inflammatory painkiller, such as ibuprofen, is a suitable alternative. Stir one tablespoon of salt into 1 cup (250 ml) of warm water, until it is completely dissolved. Take a mouthful of the salt water and swish it around in your mouth for about 30 seconds, then spit it out into the sink. Repeat this procedure until the salt water is gone. You can do this as often as you like throughout the day. If you’d like some more pain management ideas, click here, or contact our Surrey orthodontist’s office today!